The Walter P. Reuther Library, official repository for the records of the American Federation of State, County, and Municipal Employees, has produced an online exhibit about Dr. King’s fateful visit to Memphis in support of AFSCME Local 1733’s sanitation workers. From the Reuther Library: In 1968, in Memphis, Tennessee, the labor movement and the civil rights movement came together in a monumental struggle for human and public employee rights. On February 11, over 1,300 sanitation workers — nearly all were African-American — went on strike demanding their basic rights to organize a union, to gain a living wage and to receive the respect and dignity due all working men and women. During the strike Dr. Martin Luther King, Jr. came to Memphis to support the workers but was tragically assassinated. This exhibit explores the drama of this historic strike where marchers wore signs simply stating: I AM a Man. Additionally, the Robert W. Woodruff Library at Atlanta University Center houses the Morehouse King Collection and Boston University houses the Dr. Martin Luther King, Jr. Archive. For more information about the collections held at GSU Library, please contact the Special Collection and Archives department (404.413.2880 or archives@gsu.edu). Photograph Caption: U.S. 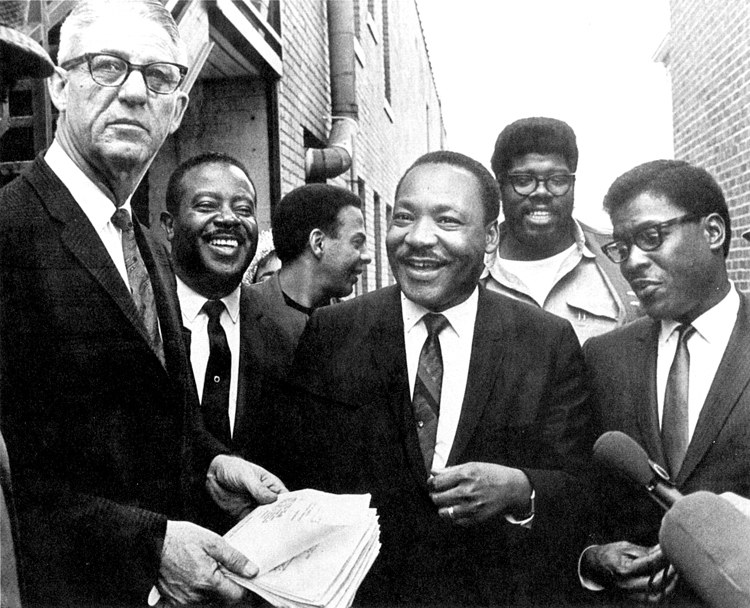 Marshal Cato Ellis (far left) is serving Dr. Martin Luther King Jr. with a restraining order that forbid the group from leading a march in Memphis on April 8th. Behind Dr. King are Rev. Ralph Abernathy, Andrew Young, James Orange and Bernard Lee (left to right). Citation: Sellers, Barney , “Restraining Order,” I Am A Man, accessed April 2, 2012, http://dlxs.lib.wayne.edu/iamaman/items/show/188. This entry was posted in African American Studies, Digital Collections, For Faculty, For Graduate Students, For Students, History, Oral Histories, Primary Resources, Special Collections & Archives. Bookmark the permalink.